Add SpiceJet to your favourites! Add Thomas Cook to your favourites! Add Air Asia to your favourites! Add Emirates to your favourites! Add Jet Airways to your favourites! Add Goibibo to your favourites! Add Booking to your favourites! Add Expedia to your favourites! 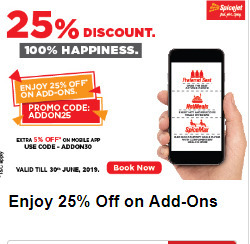 Do you want to receive more SpiceJet offers by email?